Quite simply, a website conversion is how much of the traffic that arrives on your website converts into a lead or sale for your business. There is a HUGE obsession with numbers in the online space – Facebook followers, page views on your website, shares on Instagram – but I notice a lot less focus on what those numbers mean in terms of revenue in your business. In this blog post, I’m going to focus on helping you understand how you can makes small changes to your website, that will increase your web traffic conversions. And we’ll do that by talking about how you can turn your website traffic into subscribers on your email list. If you need help with building your website in the first place, my Ultimate Guide to Creating a Website For Your Business walks you through that proces..
An opt-in (or lead magnet) is something you offer your website visitor in in exchange for giving you their email address. For this to really work well, your lead magnet must be relevant to the topic of the blog post you’ve written. It also needs to solve a specific problem. And, ideally….moves that website visitor one step closer to deciding that what your offer is the perfect solution to their current problem. Looking for ideas on how to come up with enticing lead magnets? My FREE course, Lead Magnets For List Building, might just be perfect for you! One major web conversion principle is the use of colours. To draw your website visitors eyes to the buttons that lead to conversions, pick a colour that stands out on the page. Generally, contrasting colours will work well for this – and an online tool like Adobe Kuler can help with this process. Select the Complementary colour rule from the dropdown, and it will give you some colour ideas that are on opposite sides of the colour wheel. Whether you love them or hate them, pop-ups are an effective website conversion tool. A pop-up is a window that suddenly appears on the screen and this is a place where you can share your lead magnet effectively. The key to successfully using pop-ups is to reduce the irritation factor. The message should be clear and to the point, so visitors understand what you are asking of them. Build into the design an easy option for users to close the pop-up if they are not interested. Most 3rd party tools that you use to create pop-ups will have an inbuilt feature where you can hide the popup for a certain amount of time after someone first lands on your website. This helps to reduce the irritation factor, and increase your web conversion signups. Split testing your pages involves creating two similar, but different pages, and testing them both out on your visitors. A variety of online tools and plugins make it easy to split test a page on your website. Thrive Leads is a WordPress plugin that allows you to do this right inside your website. How it works is that giving each page a certain amount of website visitors, the tool will calculate which page got more results. You can then take your winner, and split test it with another version of the page. Over time, this allows you to create landing pages that get much higher conversion rates. It’s pretty simple maths – the higher percentage of website visitors that join your list, the more of those people that are likely to become your clients and customers. The sidebar of your blog post can be a valuable piece of real estate on your website. With more people viewing websites on mobile, this is possibly becoming less relevant – but even so, it’s worth customising your sidebars to be specific to your content. By using a custom sidebar you can focus on featuring a sign-up box for your lead magnet that is specific to your blog post. I see lots of blogs that have a whole HEAP of stuff in their sidebars – social media follow, widgets for ads, links to Facebook groups, and 2-3 lead magnets offers. To really get good at website conversions, less is more. Give your website visitors only 1 option, and they’re more likely to take you up on it. Highly customised (and uncluttered) sidebars can help with this process. When people visit your website, chances are they’re not going to sit and read every post in great detail. Most visitors are skim readers. They skip over large blocks of text and just take in the headlines. To make your content easier to read, you need to layout your content in a way that makes for very easy skim reading – using headlines and bullet points. Headlines should be brief and to the point, allowing readers to skim the text and still have an idea of the message. Your headlines should give a good overview of what your article is about, so that even the quickest skim reader can take away something useful. And those who are really interested in the content, will then go back and read the paragraphs in more detail. Whenever possible break text into bullet points. Much like using headings, bullet points are help to quickly getting through text while still understanding the information presented. Video is also a great format to relay information quickly and easily. You don’t need to have a video on every single page of your website, but for those posts where it’s relevant, definitely start working on including it. Want to see an example of what I mean? This post about building your business website incorporates a mix of text and videos. As website building is such a technical process, it’s much easier to show (through video) than tell (with words) – and improves the user experience. Personally, I find videos much easier to create anyway – so for me, it’s a very useful source of content for my brand. Understanding how to convert visitors into leads is a powerful way to grow your brand, and business revenue. You need to create great content – your blog post, your lead magnet – and then set up your website in such a way, that people who land on your site, are compelled to join your email list. Need help with coming up with ideas to build your list? 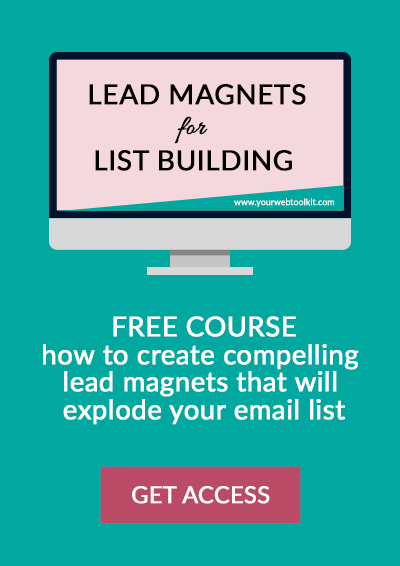 Sign up to my FREE course – Lead Magnets for List Building – and learn how to make irresistible lead magnets that fill your list with people waiting to buy from you.